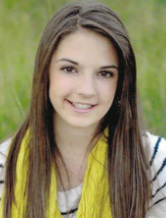 Bree Ann Fotheringham, 15, is a high honors student at Legacy Junior High. She began violin at age five and immediately took to fiddling. By the age of eight she had “fiddled” in front of thousands and won several talent competitions, including the Utah State Farm Bureau’s statewide Talent Find at age seven. At age eight she began studying with Dr. Shi-Hwa Wang at Weber State University. She has placed 6 times in the ASTA Stringfest competition and was invited to perform at the Bonneville Chamber Music Festival. At age twelve she began studying with Karen Child and was accepted into The Gifted Music School on scholarship, directed by Eugene Watanabe. In April, Bree was a winner of the Amercian Fork Salute to Youth competition and soloed with the American Fork Symphony. She has performed in master classes for Andres Cardenes and Leon Fleisher with the Gifted Music School and in a radio program on KBYU’s Classical 89. Bree is the daughter of David and Jana Fotheringham and has also excelled in vocal performance, piano, and music composition.